Navigating the app store can sometimes be like perusing a box of chocolates; you never know what you’re gonna get. An app, similar to a mysterious chocolate, can be a hit or a miss. There are a gazillion apps out there; Sometimes they can be wrapped in a pretty bow but fail to please. Sometimes it can cost you extra. 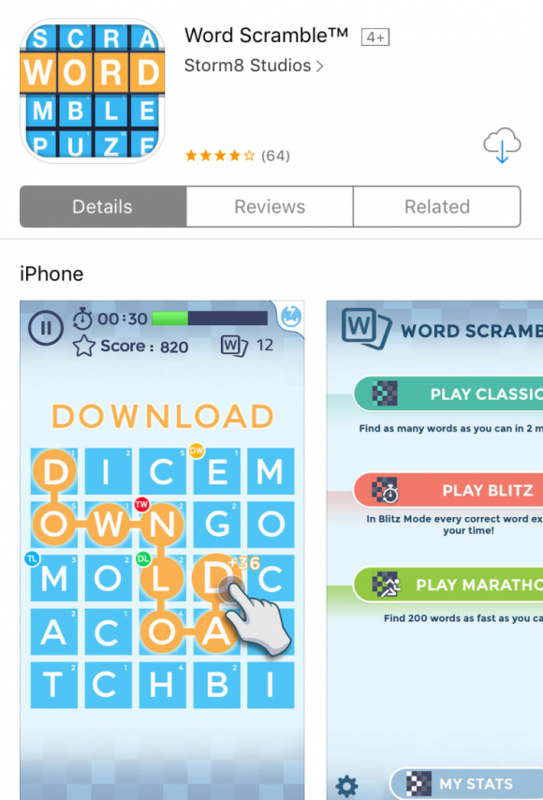 We hand picked the best word game apps (free) so you’re sure to know what you’re biting into. An app that is truly puzzling, this gameplay is thought provoking and enticing. The objective is to turn every letter tile green by creating words from shifting the tiles up and down. This design imitates that of a traditional lock, with rotating dials to finally find the right combination. With a clean design and attractive user experience, the only frustrating aspect of the game is the challenge posed by this “lock picking” experience. At some point it became more about forming whatever arrangement I could just to turn the tiles green rather than focusing on creating words themselves. During the more challenging levels, you’ll be sure to turn to Merriam Webster, one of the app’s sponsors, or The Word Finder to look up some of the gibberish words you might end up making. They say you learn something new every day, eh? word comes to mind. Use your letters carefully, though, since you can end up with 5 letters at the end and none of them vowels. In this case, you can reset your tiles with a small deduction in points. Mahjong sparks creativity and promotes brain strategy. The longer the word, the more points you score. 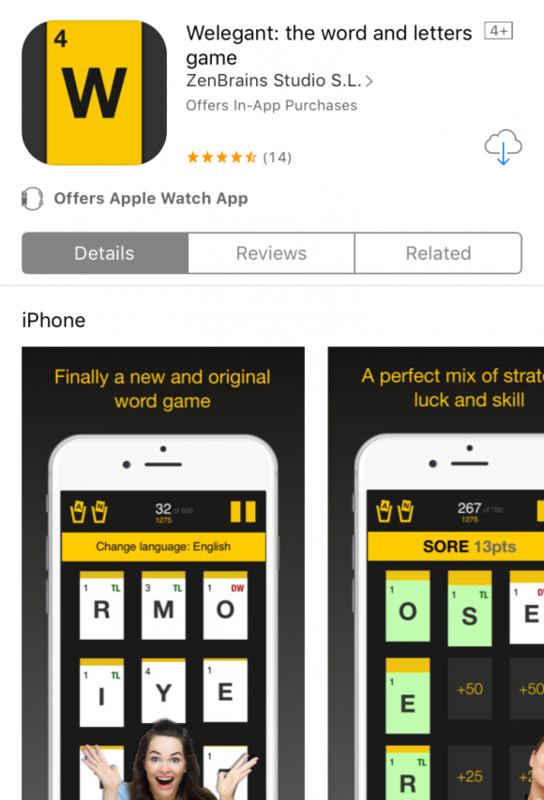 It definitely earned its spot on our short list of best word game apps. Gimme some mah of that! 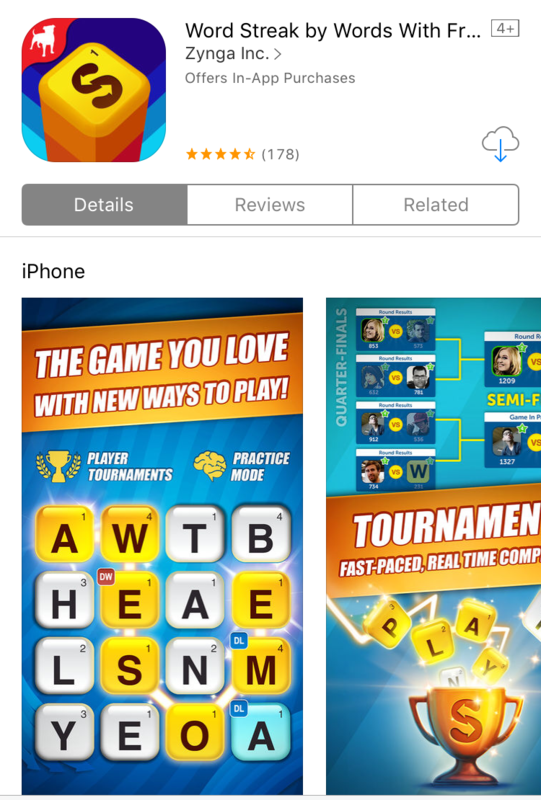 Once you’re on a streak, it’s hard to stray away… this game is as addictive as its parent app, Words With Friends, and keeps you coming back for more. What can be thought of as the modern “Boggle,” you use a specific set of letters to form words by swiping or “streaking” your finger across them in arrangement. Racing against the clock, you form as many words as you can. Score value increases with the complexity of the word. Equally entertaining, you can play against a random opponent, a friend or a bot. Deceivingly simple, you’ll be playing this game for more than 20 seconds. Given five letters, the player must arrange them to form the pre-selected word. After a few quick rounds, your mind is sure to be in the mentality of the game. Upon identifying the correct word within the 20 second time frame, the clock automatically resets to 20 seconds and the next letters appear. For every successful word you gain points and the more quickly you form the word, the more points you score. You can modify the timer to 30 seconds if you need more time or 12 if you’re confident in your skills. 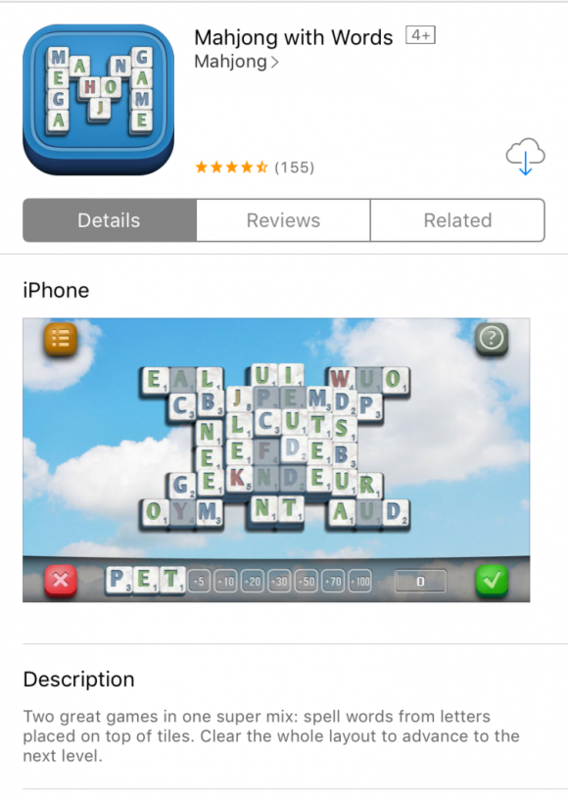 An intelligent and sophisticated version of a boggle-esque Scrabble focused on individual performance, WordScramble focuses on the user’s performance and offers three versions of game play. With a larger letter board than competitors’, the app expands the horizon. Certain letters are assigned boosters and words are formed by sliding your finger across the tiles. In traditional play, you form as many words within the tile group as you can in 2 minutes. In “Blitz” mode, every correct word increases your time. 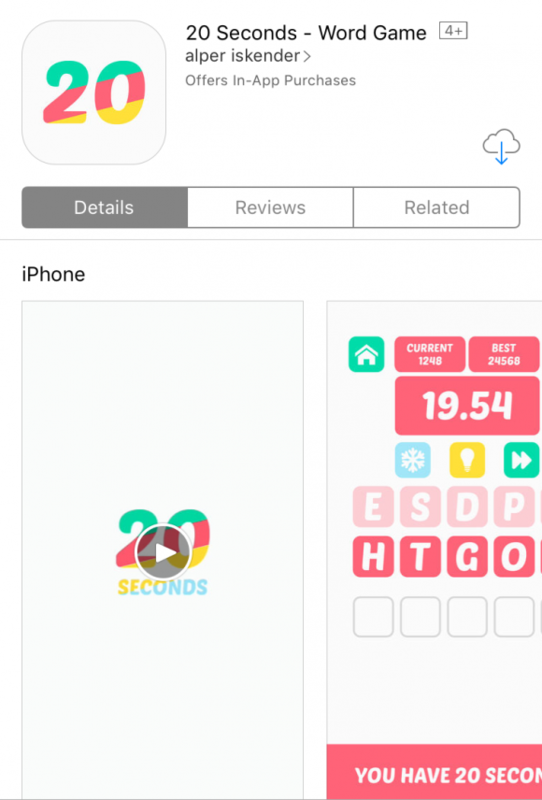 In “Marathon” mode you are tasked with finding 200 words as fast as you can. No matter which mode you choose, you’ll be scrambling to beat your previous score and accuracy rating every round! Wordbubbles gives you an array of letters to form a single word. Base level begins with three letter bubbles and the amount increases as you work your way through the game. 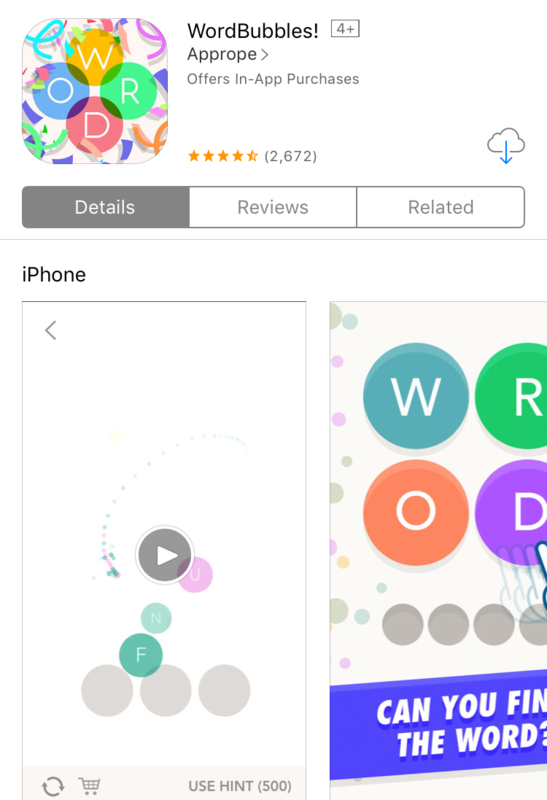 Swiping your finger over the letter formation keeps the app interactive. Simple hints such as “animal” or “food” can be seen when you are struggling. Unlike many other word games with similar features, Wordbubbles provides you only with the necessary letters to form the word. 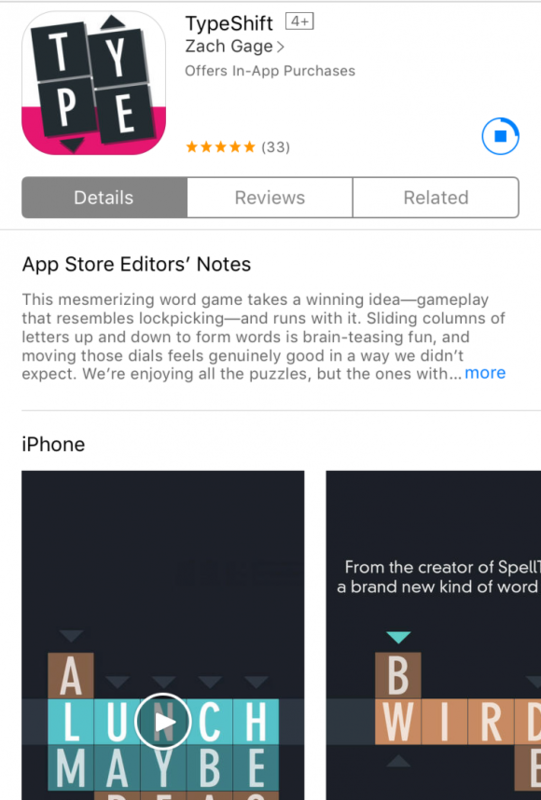 One of the best word game apps out there. Float your way up to the top!